Here is my beautiful Girl Jessie - she is 15 months old & is absolutely a joy. Jessie has a had a rough start to her life medically but now is a thriving bundle of joy. Jessie is so relaxed & just loves hanging out. Her passion would have to be water - whether playing in it or swimming in it - she honestly just smiles. 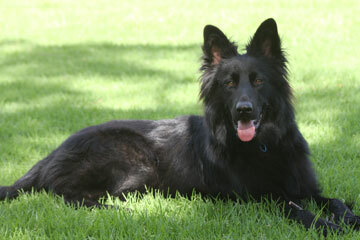 What a Beautiful Black Shepherd! Great picture too. She sounds like she is living a life of pleasure. Take care of your Angel and she will take care of you!! !